I’ve constantly been on the hunt for a beautiful outdoor dining set, scouring pinterest for deck ideas, looking at set after set, pretending to have a dinner party at every piece of patio furniture I pass by in stores, but nothing. My patio set dreams have got put on the back burner summer after summer. Then I fell in love with a set, one that we could barely afford, but darling Mr. Fynes bought it for me for Mother’s Day… only to have to return it a few weeks later because the frame was bent and the finish was already starting to rust. Then I cried, and we went back to eating on a blanket on the front deck, the kids loved it, but blankets are for the park. You might not see the gem like qualities I did, but from my furniture studies back in the day of design school I knew what I had on my hand was a Duncan Phyfe table and 3 harp back chairs. I’m totally a ‘restore the beauty’ type gal, and would normally spend hours stripping a piece of furniture and bringing it back to it original lustre. But this set had some issues- chipped veneer, missing claw feet, busted hardware, someone had lost their love for it to chuck it curb-side. But… nothing that a new paint job couldn’t fix! Ta-da!! Isn’t it peerdy?! 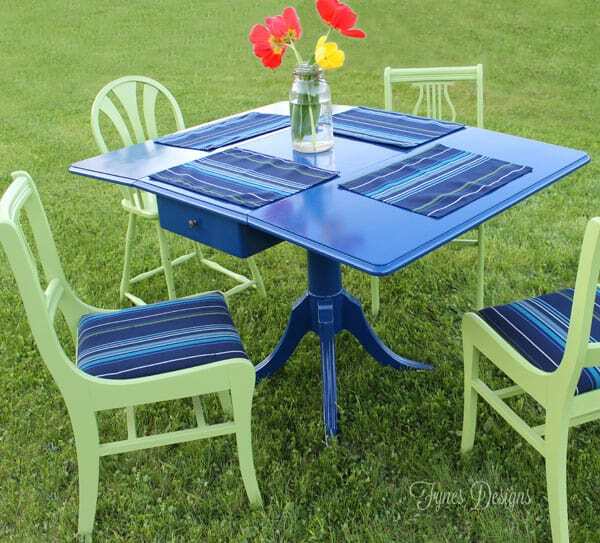 I brought this drab dining set back to life with help from PPG Voice of Color paint and Sunbrella fabric. I’ve been posting progress shots on Instagram while working on it, so you might have caught the sneek-peek there. I’m SO happy with the results. The fabric I chose is ‘Stanton Lagoon’ a new collection from Sunbrella. It is a premium outdoor fabric so I won’t have to be concerned with mold or mildew… and we’ve already had a few kiddo spills that haven’t been a concern either! The photos show the colors a touch more vibrant, but I absolutely love the combination, they coordinate perfectly with the fabric. The colors are ‘Blue Tang PPG10-32’ and ‘Always Apple PPG1118-5’ from PPG Voice of Color. 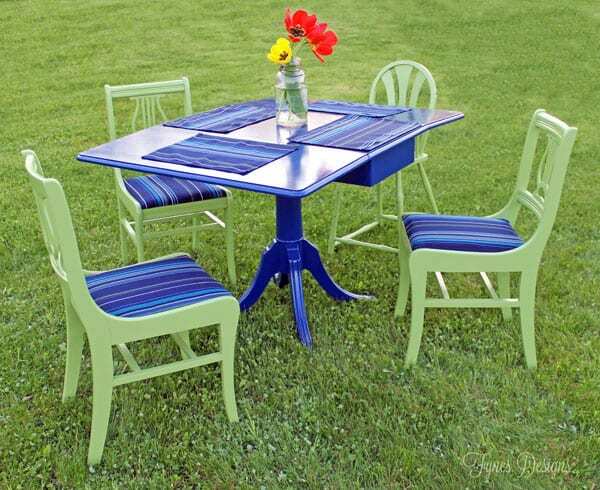 I chose exterior Sun-Proof in a Semi-Gloss for both the table and chairs. The remaining fabric from upholstering the chairs was the perfect amount to sew some matching placemats. The small drawer on the end of the table is perfect storage for the placemats in between meal times. 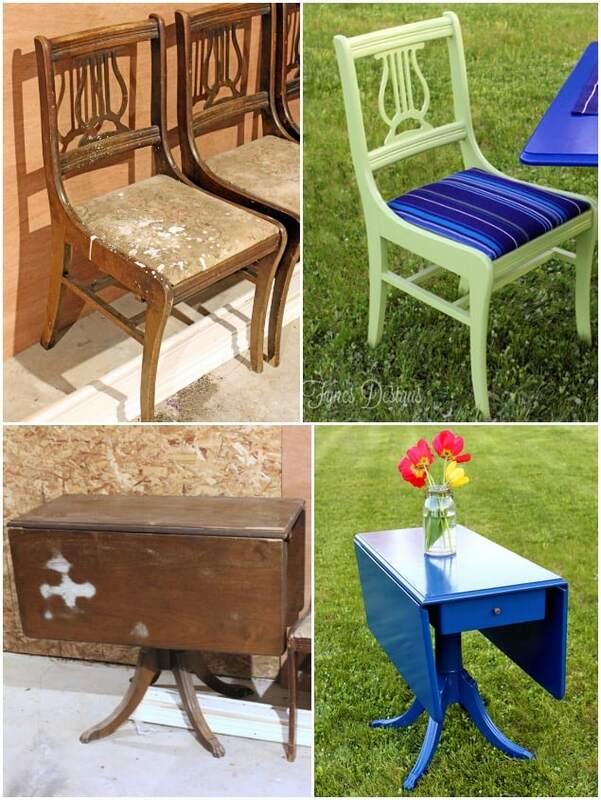 Can you believe the transformation from garbage to a functional outdoor dining set? Using this vintage set couldn’t be better for our home. It’s solid construction makes it heavy enough to stay put on a windy day, the perfect patio furniture! The fourth chair doesn’t match the set of course, it’s a vintage highchair we picked up at an auction for $4, but works great for our little family! So what do you think, was painting the furniture a good idea, what would you have done? We’ve been dining alfresco a lot lately, I recently hosted a little party I can’t wait to share with you. I am impressed and that is not an easy thing to do!!!!!! Thanks Julie, that means a lot coming from you! I hear you on the outdoor set challenges – I’ve been waiting for years to get something too. Love your color choices and how beautiful this turned out. Thanks Cheryl, I could never make a decision, then it seemed like the summer slipped away! This is fantastic! I am looking for patio furniture and I think I now what to do now! Awesome! I’m glad this set could inspire you! FABULOUS! I LOVE the colours and the whole look! WOW! OMG I had to look twice to make sure they were the same table and chairs!!! Amazing job! Wowza!!! this is an amazing transformation!! Wow! Absolutely stunning! 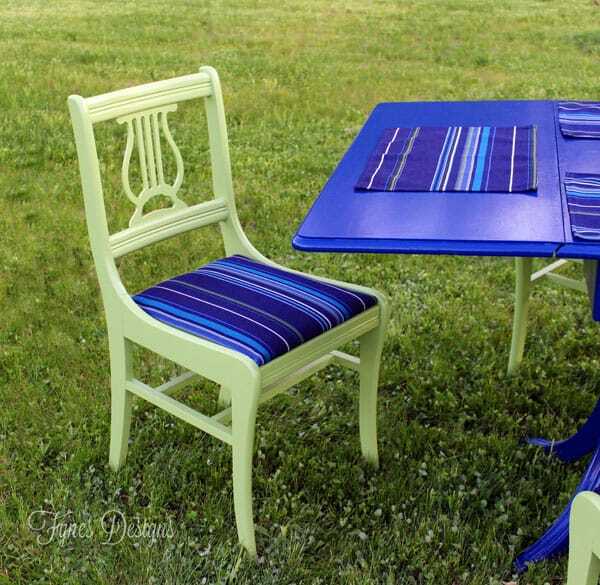 Love the colours and the fabric choices – so fresh and fun and perfect for outside. Such a phenomenal transformation. WOWzers!! Oh my goodness…that came out stunning! Wonderful colours for summer and now it’s making me want to redo my patio set lol. Beautiful! THanks, I’m really happy with the colors I chose! Our house is orange, so I really had to do some thinking on coordinating with it! Oh WOW Virginia!! You did a FABULOUS job!!! Everything is perfect! I love the colors! Wow you did an amazing job! I would seriously pay for something like what you created! Awesome! Looks amazing!! Is the Sunbrella fabric comfortable? I need something more permanent (yet comfy) for my outdoor daybed. Unbelievably comfortable!! It’s not plasticky or rough, you’d never know it was outdoor fabric, you could make drapes with it! 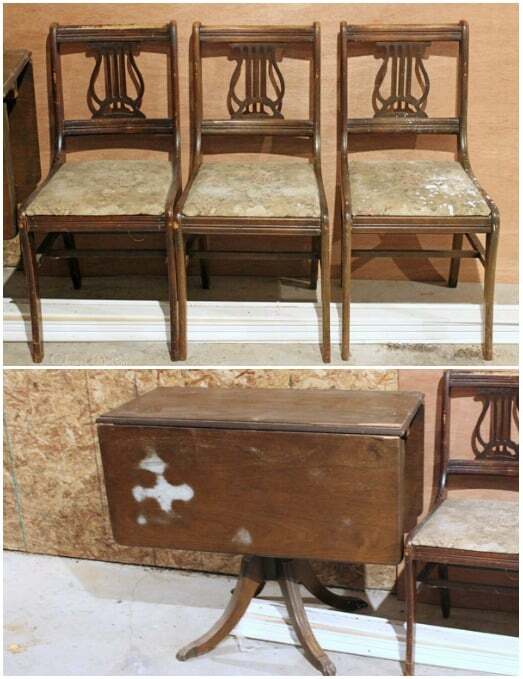 I love your post and you were so right to restore those beautiful pieces! I have a similar set from MIL’s house that I used for years and finally put in storage a couple years ago … cannot decide what to do with it … and I keep thinking I want to paint the chairs with pastel colors and use throughout my house. I’ll be anxious to see how your paint holds up in the outdoors … so keep posting about this beautiful set! Oh different pastel colors would be so pretty, great idea. I know the feeling of the lump in your gut to paint wood furniture. I’ll be sure to keep you updated about the finish. Thanks for stopping by and commenting! this is gorgeous! I love the colours you chose! Gorgeous V! I love love the vibrant colours of the paint and that beautiful fabric…what a gorgeous space to eat! Amazing Virginia!! Who tosses a Dunkan Phyfe?? Incredible transformation. I admire those who can invision something & make it happen. I know! obviously someone who didn’t know it was a Duncan Phyfe!!Thanks! I agree with everyone else’s comments! I love, Love, LOVE what you did! 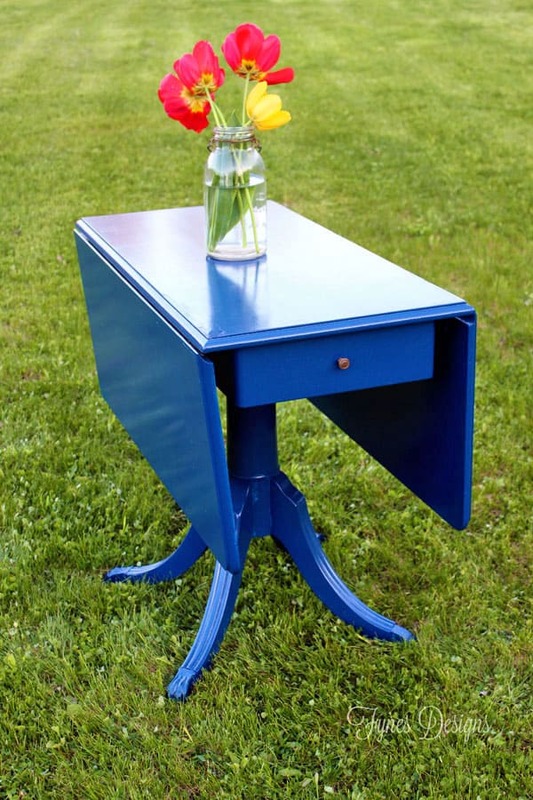 I think your colour choices really made this DIY outstanding! It’s stunning! I have that same table that I pulled from my neighbor’s curb. The next neighbor over had given it to them years ago and now it’s making it’s way down the street. I can’t wait to get mine painted. Right now, it’s in pretty sad shape. I am so inspired by what you did with the table and the chairs. I’m so happy to hear you’re inspired. Lucky you for finding one so close, I tell you its working out to be the perfect patio set! 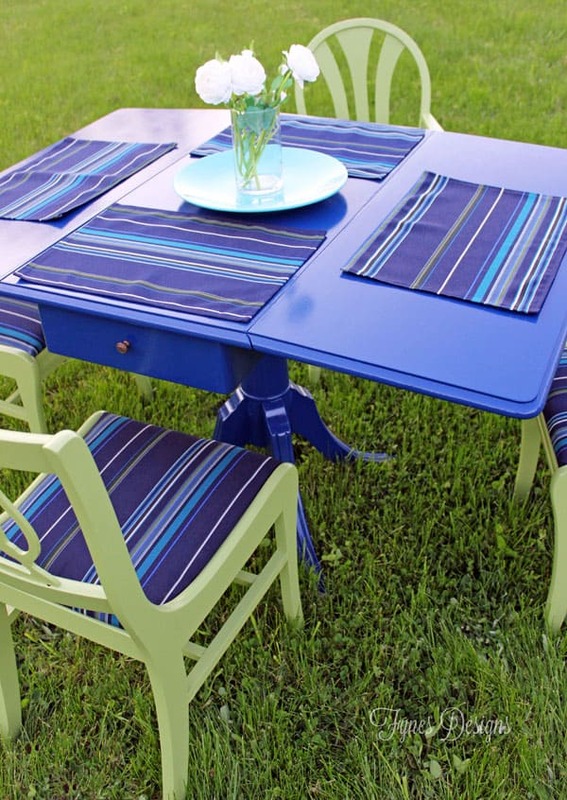 Love the blue table and that fabric fits perfectly with it! Oh this is a wonderful restore….beautiufl fun colors. Just love it when someone can take their imagination to such high levels. Thanks for sharing it. Thanks for stopping by Sylvia, I’m really happy with the results! I love the colours! WOW is all I can say. I am coming to your place for dinner! COme on over! I’ll make you a yummy treat! OMG – love the transformation! Awesome! Check it out! Wow, Virginia – that looks amazing! I love the colour of the table. I just love the table full-stop. What a great piece! Thanks Tara, it has turned out to be the perfect patio furniture for us! that set is perfect-o! Wow, that paint looks like glass, amazing job! High five! This is beautiful! I love the colors on it. I’m pinning it! Wow!!! Love this!! Great work! Wonderful job! I love the colours! I love this!! I was wondering do you cover it and leave it outside or just bring it our for a special occassion? I am assuming it would not stand up to the elements if not covered some way, but I love the colours and how unique it is! The furniture looks beautiful and I love the colors, it would perfect for me. Beautiful, Virgina! I totally just finished very similar chairs for our outdoor table- so funny! I love your bold colour choices!! Love this! What an incredible transformation. I love the colours! Wow what an amazing transformation! Simply gorgeous! Love this color! I have the same table 🙂 Love your creativity! LOVE this project. My parents owned a Duncan Phyfe table and 4 harp back chairs.but after they died I’m not sure what happened to it. Would love to do this with my parent’s set. Beautiful! I love those, especially that shade of green. We.were given a table just like this one with the complete brass feet. My husband soaked the feet in carburetor fluid to remove all of aged to black finish on them. The table tope was badly scratched to I opted to pain mine too! Bright red! I use it inside and really like it! Thanks for sharing yours, it is lovely! Oh I’d love to see it in red! Thanks for dropping by. Beautifully done! How did you achieve the great results ? (I may have missed that part). This transformation turned out so beautiful. I never would have thought to turn them into outdoor pieces. You said that the table had chipped veneer. How to you handle a piece of furniture that has veneer peeling off of it? Do you remove it all strip by bloody strip or what? I actually didn’t remove it, I just painted over it. But I have seen that if you wet a bath towel and leave it to soak it will take it right off! We are redoing our patio and I can’t find any furniture I like. I’d love to try this, but in curious as to how it holds up to rain, etc. This set has never seen the rain becasue we have a covered deck. But we have other patio chairs that have the same paint that sit by the lake and they have held up great! beautiful!! so this kind of paint will let wood furniture stay outside??? Hi Barbra, The paint held up really well, however, my set is on a covered deck so it is basically out of the elements. I don’t think it would hold up as well if it were out in the rain. Very beautiful colors you have choose. and very interesting work. This is gorgeous. Does the paint weather proof the furniture or should this be brought in when not in use? Do you put a clear seal over top? I have a covered deck, so it was fine there. We do bring it in when the weather gets cool.